I’ve been enjoying watching this thread from the start. You’ve got a really good concept for this challenge. Been awesome watching it evolve. Stopping by to see what is going on. Looking nice Goro. Keep it up! o-l-d, melvil, icedeyes, beelow Thanks! Thnx for the suggestion. I’ll definetly work on the light situation a bit more. I nailed the important elements for the composition. 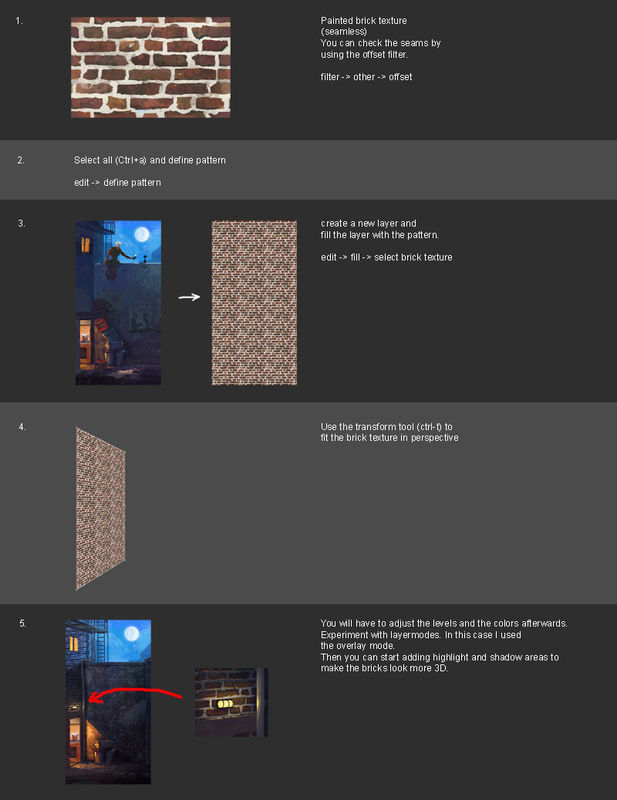 I made a quick tutorial how I painted the bricks. I didn’t find time to go on yet. I will try to post an update in the next few days! I’ve always loved your style, it’s great to see you in another challenge sharing all the WIP… go Goro!! still a lot of work to do? just a WIP… hmm… i thought its already in the finished section, hehe… It looks really great, nothing to add here, but I needed to comment it good luck! I still think you should collect ur images in a book, when you’r done. big fan of those sketches, mate! the final concept is awesome, colours and comp. the apron on the floor seems to me not really necessary or somehow distracting the ground comp…could the robot be wearing it, may be? thanks for the tutorial, very helpfull to see the process and i will be enthousiastic about the progress on this one. great work! Hi Goro, all the sketches, concepts and colour palettes are superb. Those concepts could be a serie of a robot and a black cat, un put downable. I’m looking forward to be amazed. Cheers! Oh, and I have to say: Your use of colours is exquisite it is realy a joy to watch your sketches! i just love all the sketches you made! Hey Goro, your style color roughs is quite unique. I particularly like the one of the massive robot playing chess with the small cat. the bird on the robot’s head is very amusing, suggesting “bird brain” yet brawny. I finally managed to work on my painting a bit more. I’m still detailing the environment. I designed a movie poster for the wall. Finally I found some time to move on.